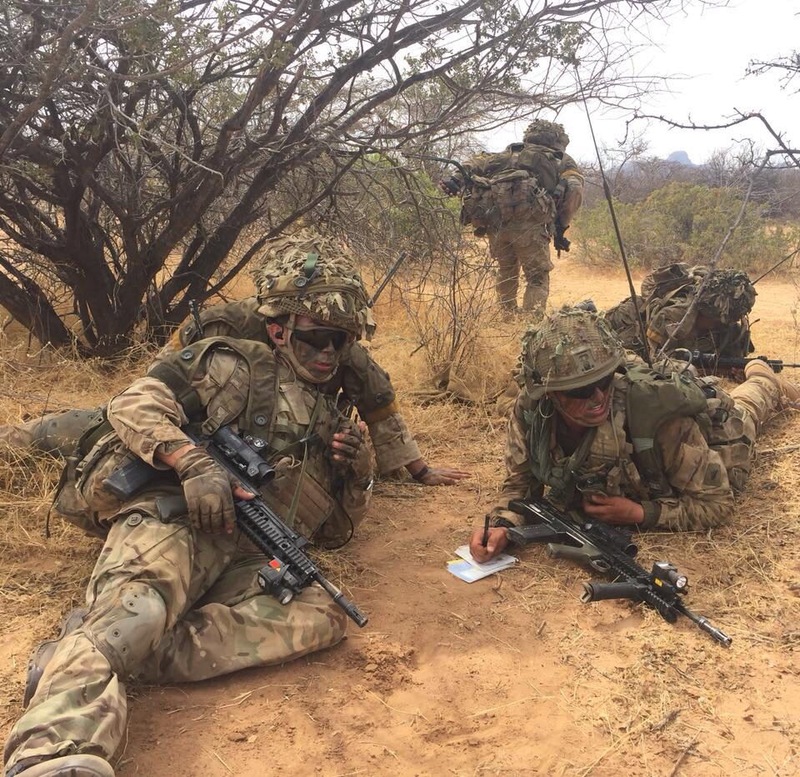 1 Royal Gurkha Rifles (1 RGR) recently conducted Exercise Askari Storm in Kenya. The Battlegroup (BG) consisted of 1 RGR and E Company, 15th Kenyan Rifles from the Kenya Defence Force (KDF). Attachments from across 16th Air Assault Brigade joined the BG and having spent 6 weeks with us are now a part of the 1 RGR family. In addition, 150 Kingsmen from the Duke of Lancaster’s Regiment provided the ‘neer peer’ enemy forces for the exercise. The enemy on Exercise Askari Storm is significantly more capable than the last time the BG was in Kenya. They gave the BG a good run for its money, and undoubtedly helped create a much more realistic and demanding training opportunity. The exercise was divided into four tactical phases. Phase 1 (Warrior): The Companies carried out live firing up to Platoon level night and day as well as Company level blank fire training. This phase is an outstanding chance for junior commanders to develop their Platoon level skills, particularly with use of night fighting equipment and thermal sights. Phase 2 (Centurion): This phase consisted of 3 Company group battle exercises. Each exercise was 36 hours. First was the Enabling Lane, delivering humanitarian aid to a village as well as seizing an enemy held airfield. The second rotation saw the Companies establish a defensive position to protect a bridge. Finally, the Companies went through the Combined Arms Live Fire Exercise (CALFEX), which was supported by 105mm Light Guns from G Battery 7RHA and 1 RGR’s Mortar Pl. B (Sair Bair) Coy again broke the British Army Training Unit Kenya record clearing their positions on the second day in only 43 minutes. During this phase the KDF conducted Company level training working alongside 4 Rifles. It was particularly impressive to see their desire to learn and share best practice, especially considering they had just completed a year long tour in Somalia. Phase 3 (Marauder): Marauder was the first opportunity for the BG to operate as a full BG, and was a rehearsal for the fourth phase. This included a BG attack and obstacle crossing at night. It was an excellent exercise to give the BG a chance to try different approaches and to experience the complexities and frictions of operating with so many moving parts. The BG developed the use of dispersed movement at night to hamper the enemy’s ability to find us and strike us with their artillery. Phase 4 (Spartan): The Final Exercise. This was conducted as a full BG, which included an Advance-to-Contact, Deliberate Attacks, and Defensive Operations. The BG really excelled in the defensive phase, dominating the tough terrain around the defensive positions. Before the BG deployed, 1RGR’s religious teacher, our respected Punditji, came to Kenya to visit the troops and conduct a Hindu service in which he asked for the Goddess Durga Matha to bless us all. The Kenyan training areas provide many difficulties, all of which created a realistic environment for expeditionary operations including; flash floods which can wash away our vehicles, difficult terrain which affected vehicles, equipment and the soldiers, long lines of resupply and communication, local tribal conflicts; malaria and heat, wildlife and the threat of theft. The soldiers worked extremely hard and the BG conducted all operations to a very high standard. 1 RGR had a fantastic exercise, and we are very grateful to the KDF and all those who came to support and work as part of the 1 RGR BG family. The Gurkhas as ever loved being in Kenya and operating in such beautiful scenery with such a wide array of interesting wildlife. Volunteers from the BG also took part in community engagement improving the conditions in a local school and orphanage. Over 90% of the BG managed to take part in some adventure training, which included; kayaking, rock climbing, mountain biking, white water rafting or safari.